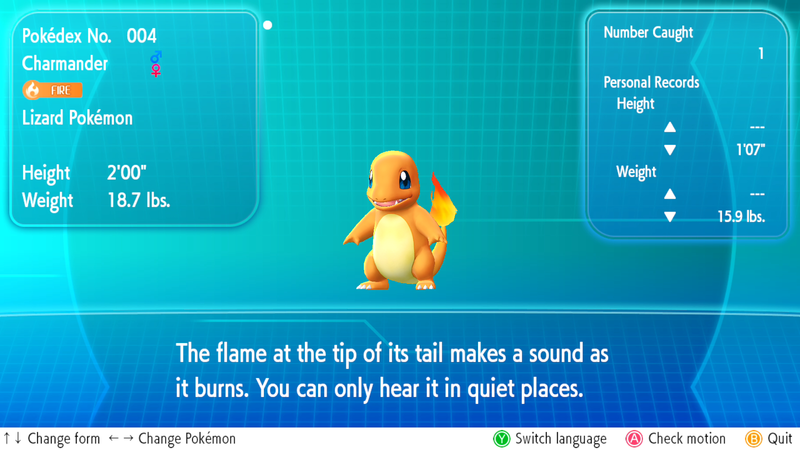 Pokemon Let’s Go might be all about Pikachu and Eevee, but we wouldn’t blame you for wanting a classic Kanto starter Pokemon: Bulbasaur, Charmander or Squirtle. Luckily, we know where to get them. Pokemon Let’s Go Pikachu and Pokemon Let’s Go Eevee do something most Pokemon games don’t – they forsake the choice of starter Pokemon at the game’s onset. Back in the day if you picked up Pokemon Blue you could still pick Charmander and evolve to Charizard even though Blastoise was on the cover, but in Pokemon Let’s Go you’ll get either Pikachu or Eevee depending on your game of choice. Luckily Pikachu and Eevee aren’t actually version-exclusive Pokemon, so you can catch them, but the next question for many fans is obvious: what about the classic, iconic starter Pokemon? Well, have no fear. If you want a Charizard, Blastoise or Venusaur (and really, if you’re cool you want a Charizard – I know how it goes), you’ll need to get their earlier forms. These are Pokemon well worth having – they’re iconic, they’re powerful, and they have mega evolutions you can make use of in the late game. These Pokemon can be found in the wild rarely, but you can also pick up a guaranteed one of each from NPCs out in the world if you know where to look. 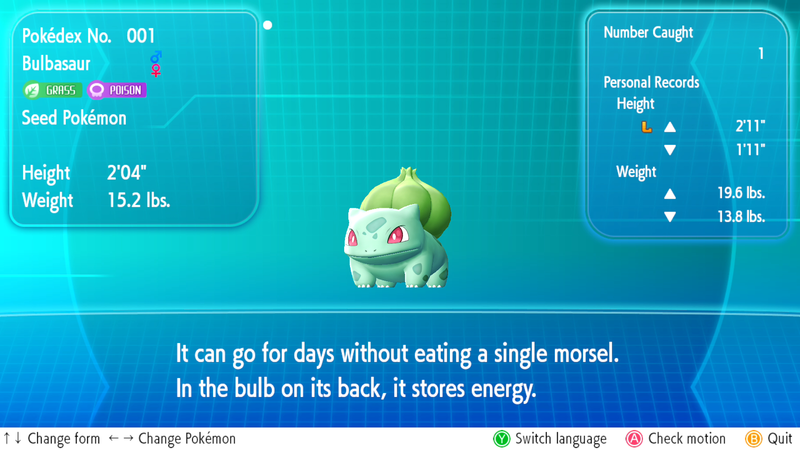 A free Bulbasaur can be had from an NPC in the game found in a house in Cerulean City. The house is one row down from the topmost row of the city, and it’s the furthest house on the left, next to the Pokemon Center. You must have caught at least 30 Pokemon (including duplicate catches) to get the trainer to hand it over to your care, but if you meet that requirement you’ll be handed the Bulbasaur with no further questions asked! If you want to catch Bulbasaur naturally, take yourself back to Viridian Forest, one of the earliest ‘dungeon’ style areas of the game. Bulbasaur can be a wild Pokemon spawn here, but very, very rarely, so be prepared to crack out some lures and catch a lot of Pokemon trying to get them to spawn. If you want a free Charmander trade, simply head to Route 24, which is the pathway north of Cerulean City that you must cross the Nugget Bridge to reach. The main story will take you here in search of the famous Pokemon fanatic Bill. Up on route 24, directly north of Nugget Bridge, you’ll see a trainer standing near the hills with a Charmander. Chat to him and you’ll find out he wants to off-load the cute little critter. He’ll want you to have caught at least 50 Pokemon (including duplicates) before he hands Charmander over. Charmander also spawns rarely out in the wild, too. I’ve seen them on Route 3, Route 4 after the cave, and also in the Rock Tunnel, but this is once again a rare, infrequent spawn, so stock up on lures. You’ll actually see Squirtle a little before you can actually catch the cheeky Pokemon, as it’s causing poor Officer Jenny trouble. It actually makes her abandon her post which lets you continue where you couldn’t before – and later, down in Vermillion City, you’ll find she’s caught the Squirtle. Can a Pokemon be put under arrest? Anyway, you know the score by now – the officer wants somebody to take care of the Squirtle and keep it out of trouble. That can be you, if you’ve caught at least 60 Pokemon (including duplicates) – if you have, Squirtle is yours. Like the other starters, Squirtle also exists out in the wild to be caught. 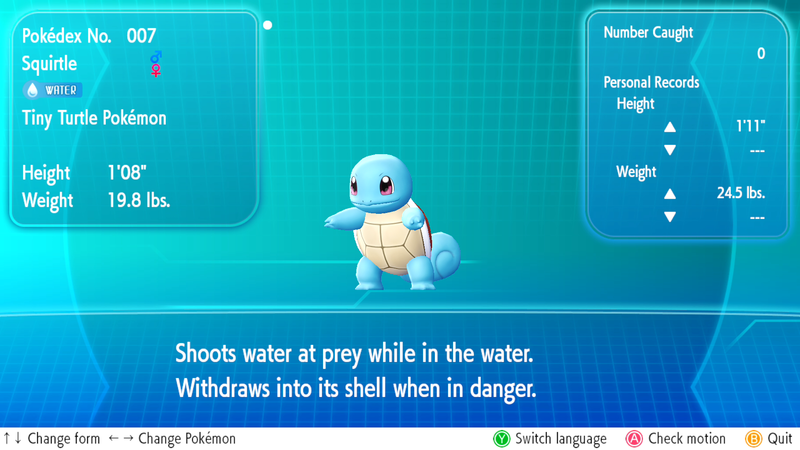 Wild Squirtle can be found on Route 24, Route 25 and the Seafoam Islands – making this the latest ‘natural catch’ of these three in the game. If you’re collecting more Pokemon, did you know you can get given Pokemon as gifts from NPCs?